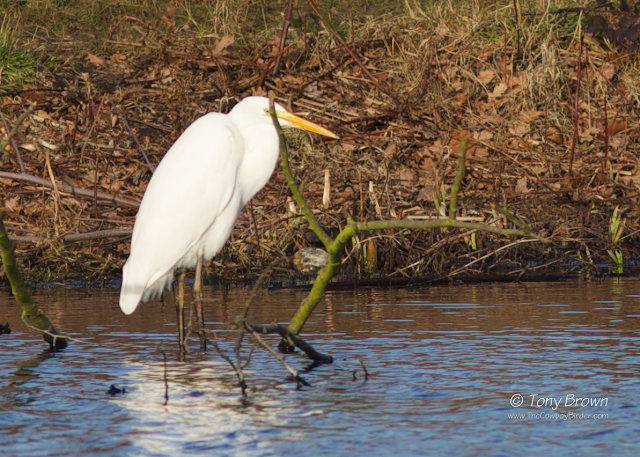 Today, I finally caught up with the Great White Egret in Wanstead Park - which is a nice big fat juicy patch tick! Ever since its discovery on Monday 8th January I've had to bide my time whilst my fellow patch workers literally roll out of bed to see this bird, and one or two others throw money at Uber drivers to tick Wanstead's 1st ever grounded record of this widely increasing Egret throughout the UK. After the birds initial sighting, it disappeared for about a week before re-appearing again on Tuesday 16th January in the same location on Perch Lake, and when Jono confirmed it was still there today, I cracked and took a slightly extended lunch hour and drove the 12 miles or so to twitch the bird - this was really the only opportunity I had of seeing it, as the thought of waiting again until the weekend was a risk I wasn't prepared to do again, especially after last weeks disappearing act! The problem with trying to bird the patch in the Winter is the lack of light in the mornings and evenings, so a lunchtime twitch was my only chance and I'm mightily pleased it paid off, even if this meant it was a 'tick and run' job with a dodgy record shot to boot - hence the ill-placed branch covering the birds head. Here's hoping it sticks around a bit longer, as I'm sure I can do a bit better than the photo below!